This Irish appetizer dish features a blessing along with shamrocks and thistle. 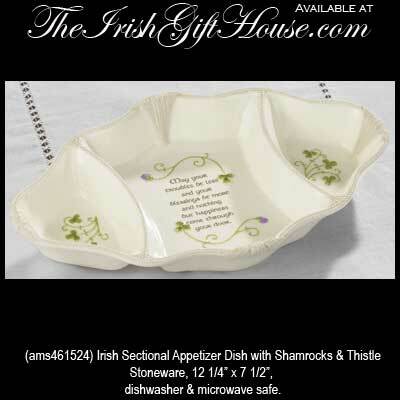 This Irish dinnerware is a three section appetizer dish that is enhanced with a blessing along with shamrocks and thistle. The stoneware Irish blessing dish measures 12 1/4" x 7 1/2" and is dishwasher and microwave safe. The Irish appetizer dish is gift boxed with a shamrock history card that is complements of The Irish Gift House.